This detailed guide is ideal for those starting out with needlework as well as more accomplished embroiderers looking for inspiration for different stitches and techniques. This new, redesigned edition includes the internationally renowned embroiderer Jan Eaton's revisions to the original text, and includes a preface by famed embroiderer Mary Corbet. The very best book on embroidery stitches I have ever seen. -- Jennifer * Daily Mirror * A must have for all new embroiderers. * SEW Region Magazine (December 2019) * Any stitcher, whether beginner or advanced, can confidently consult this book assured of its accurate and comprehensive content and it will surely be the future classic; a must-have that every embroiderer should own. * East Kent Embroiderers' Guild * Even if you own a stitch guide, this clearly illustrated dictionary is a welcome addition, either as a foundation for the novice or as a handy reference for the experienced embroiderer. * Embroidery, The Textile Art Magazine (March/April 2019) * This is a must have book whether you are new to embroidery or an experienced embroidery. Alternative names for Stitches are also included. This is much more than a stitch dictionary it is also full of interesting snippets about the Stitches. Beautiful practical and a joy to read. * Embroiderers Guild * This is a revised and updated (by Jan Eaton) edition of the classic guide, originally published in 1934. Mary's book was the original embroidery dictionary, the one that inspired the many to follow. How does it stand up today? Like every book that is deservedly called a "classic" it stands up very well. There are over 400 stitches in here, all with clear, easy to follow diagrams and in many cases, photographs of a worked sample. Each stitch also has a short description which contains information about its origin if known, use, tips for working and anything else of note. Stitches are grouped according to their use in a design, so there are chapters for isolated stitches, borders, outlines, various types of fillings, different types of stitch for canvas, pulled fabric, cut-work and more. This is how I always look for stitches when I am designing a project so appreciate this way of organising. At the beginning there is a very short section showing types of thread and fabric available for hand embroidery plus a few tips for beginners. At the back is an index, and throughout the book quite a few examples of finished work. It does not matter what level embroiderer you are, a book like this is invaluable and I wouldn't be without a stitch dictionary. I have quite a few, but this is probably the best and also inspired most of the others. Recommended for anybody who wants to learn (or is already adept at) embroidery. -- Rachel Hyde * myshelf.com * This is a book that fulfils every need for embroiderers. 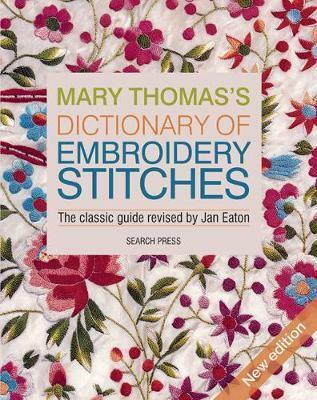 Mary Thomas's Dictionary of Embroidery Stitches was first published in 1934, and Jan Eaton has revised and updated it perfectly. Mary Thomas, author of the original edition of this book, was born in Wantage, Berkshire. She was educated in music and art, and in her twenties went to America to work as a fashion artist for the New York Pictorial Review. At the outbreak of the First World War she returned to Europe, and went to France as an army nurse. After the war, she worked as fashion editor of the Gentlewoman, and in 1930 became editor of the Needlewoman. She took up freelance writing in 1935. Mary Thomas's Dictionary of Embroidery Stitches, published in 1934, was the first of her highly successful books, and it was followed in 1936 by Mary Thomas's Embroidery Book. Although embroidery was, of course, her first subject, she also developed an interest in knitting. In 1936, she began work on an exhaustive compendium of knitting history and technique, which was published in 1938 and 1943 in two volumes. Both her embroidery and her knitting books have remained in print for nearly half a century, and are regarded as standard reference works for the techniques of these crafts.